Frazzle and Aniploish shares with us photos or recent nail polish displays. Refined and Polished shows us her jelly sandwich manis using Zoya's Blogger Collection. Lab Muffin shares with us her Greyscale nails. Colores de Carol shows us her neon gradient nails. PassionForPolish shares with us Summer Dotting manicure. The Glam Goddess shows us her recent nail polish haul. Nouveau Cheap shares with us recent finds from Big Lots. Make-up/Music/Money/Me shares with us her one word beauty reviews. Polish Obsession swatches Color Club Wild at Heart. Young and Polished shares with us her haul. Manicure Description: I used Milani Flamboyant In Green as the base with a coat of Northern Lights holographic topcoat on my thumb because the stamps are never wide enough for my thumbs. 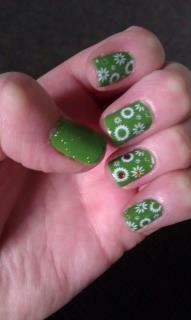 I used Konad white stamping polish and the Bundle Monster stamp BM-224 on the other fingers. Then I just stuck on some random gemstones for some more accents. Favorite Polishes: Aw man...this is a tough one. I love any and all linear holos although I don't own too many. I worked at Bath and Body Works for years and bought some random Nicole by OPI Christmas polishes that we got in one year and they turned out to be amazing linear holos which I didn't fully appreciate until recently. I love China Glaze For Audrey and all creams that are almost pastel but a bit brighter. China Glaze Frostbite is also amazing; can't stop staring at my nails whenever I wear it. Revlon Emerald City is a really pretty matte green. I just loooooove polish! Manicure Description: I used Poshe strengthening basecoat, two coats of Loreal's After Hours, then stamped (using my new DRK-A plate, which I LOVE!) with an un-named Funky Fingers mini (bottle shown in the picture), and then a coat of Poshe topcoat. You can find information on how to submit your manicures for Sunday posts here. I'm currently in need for manis for May and June posts! I'm in love with Rebecca's nail art! What a coincidence, I'm currently awaiting the arrival of my own bottle of Wild at Heart! Can't wait!